如果你家里需要更换在炉子上面带换气扇的微波炉的话， 可以看看这个， 现在BestBuy.com deal of the day is Samsung – 1.6 Cu. Ft. Over-the-Range Microwave in white OR in black, 50% off and now priced at only $99.99 (regularly $199.99! ), plus shipping is FREE! Amazon 现在 this highly rated Westinghouse WCM770B 700-Watt Countertop 0.7 Cubic Feet Microwave Oven, Black (这个微波炉是 Amazon’s #1 Best Seller in Countertop Microwave Ovens)！ 现在降价 for the lowest price of just $37.99 – regularly $99.99! For a limited time only, BestBuy.com is offering up this LG 1.4 Cu. 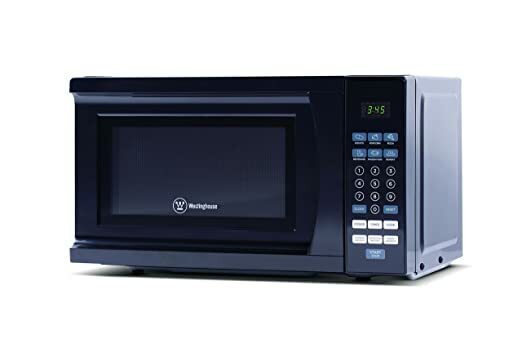 Ft. Mid-Size Microwave for only $68.39 shipped (regularly $169.99). This microwave features ten cooking levels and nine auto cook options. This microwave offers 10 power levels, 6 quick-set menu buttons, child-safe lockout feature, kitchen timer/clock and weight and time defrost. Target.com now you can get this Oster 1.3 Cu. Ft. 1100 Watt Microwave Oven for just $69.99 shipped (regularly $89.99)! This microwave oven has 10 power levels and has quick-press options for the most commonly microwaved foods. Today only, BestBuy.com now this Sharp 1.6 cubic foot Family-Size Stainless Steel Microwave price cut for only $109.99 shipped (regularly $169.99). This Sharp 1,100 W countertop microwave offers a 13.6 inch glass turntable and features settings such as auto defrost, popcorn and beverage plus it has sensor cook technology that determines when the food is ready and automatically adjusts the cooking time. 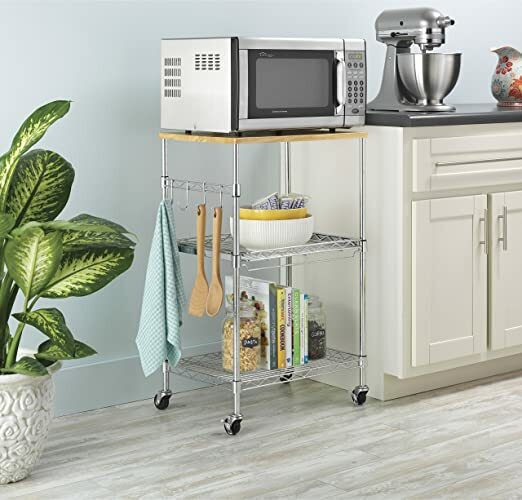 Amazon now you can get this highly rated Whitmor Supreme Rolling Microwave Cart for just $31.01 shipped. This rolling Microwave Cart has a top featuring a birch wood cutting board that can be removed and used for food preparation. Plus, the second shelf can be pulled out and both the second and lower shelf are adjustable in one inch increments. Through February 24th, Sears.com where Shop Your Way members (free to join) can score $50 back in points when you spend $50 or more on select Vacuums, Floorcare or Counter Top Microwaves. The points you earn will be added the next day and are valid for 7 days from when they are issued. Note that this offer is limited to one use per member. Through February 24th, on Sears.com where Shop Your Way members (free to join) can get $50 back in points when you spend $50 or more on select vacuums, floorcare or counter top microwaves. The points you earn will be added to your account the next day and are valid for 7 days from when they are issued. Note that this offer is limited to one use per member. Daewoo KOR-7L4BS 0.7 cu.ft Stainless Steel Microwave $59.99, Choose free in-store pickup. Pay $59.99 (regularly $69.99) and get back $50 in points to redeem on a future purchase! Today, March 29th only, BestBuy.com now you can get this Insignia 0.7 Cubic Feet Compact Microwave Oven for only $34.99 shipped (regularly $69.99). This microwave features a digital display with 11 power settings, 6 quick-touch options, time and weight defrost, and a glass turntable. And the child safety lock keeps unwanted little hands away from the cooking.